• For 4 individual main course portions, use 4 small foil containers in which the aubergines will fit snugly. Or use one large container if you're making a side dish to share. Pour about 1 cup of sauce in the bottom of each container. • Make slits across the width of the aubergine, 1 cm apart, taking care not to cut all the way through. Drizzle each aubergine with 1 or 2 teaspoons of olive oil, letting the oil run into the slits. • Put a mozzarella slice and a basil leaf into each slit and place the aubergine in the foil container. Spoon the rest of the sauce over and cover the containers with foil. • Put the containers on a braai grid over moderate coals and cook for an hour, or until the aubergines are tender. • Heat a knob of butter in a pan and fry the breadcrumbs until golden. Remove from the heat and stir the cheese and thyme through the crumbs. 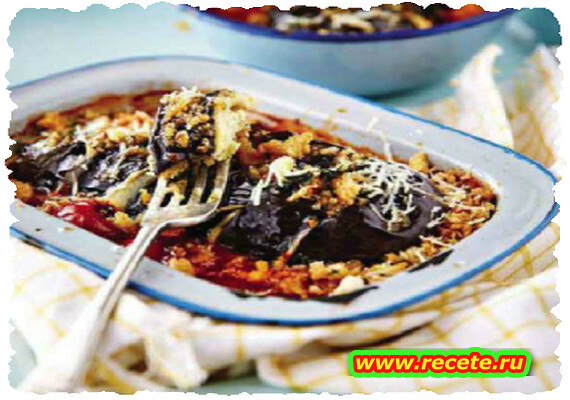 Sprinkle the crumbs over the baked aubergine and serve while the cheese is still hot.